Written by Allison Jenkins on 04 March 2019 . U.S. Farm Report Host Tyne Morgan, right, a native of Lexington, Mo., interviews economic experts, from left, Dr. Scott Brown of the University of Missouri College of Agriculture, Food and Natural Resources; Dr. Pat Westhoff, director of the Food and Agricultural Policy Research Institute; and John Anderson of the College of the Ozarks. Their “Commodity Outlook” session was recorded and broadcast during the show’s regular schedule that weekend. At the accompanying trade show, MFA Strategic Feed Specialist Mike Spidle, center, explains the benefits of Shield Technology to Mark Harth and Kaila Jones of Richards, Mo. Dean Chris Daubert of MU’s College of Agriculture, Food and Natural Resources previewed a newly completed study that shows Missouri has the capability to grow the impact of its food and agriculture industry by more than $25 billion by 2027. After a year's hiatus, the Missouri Governor’s Conference on Agriculture returned for its 48th edition Jan. 10-11 at Tan-Tar-A Resort in Osage Beach. More than 600 farmers, ranchers and agriculture leaders attended the event, hosted by the Missouri Department of Agriculture and Gov. Mike Parson. The third-generation farmer, who was named governor last June, gave a rousing welcome during the conference’s Missouri Agriculture Awards Luncheon. Parson pointed out it’s the first time he can remember that Missouri’s governor, director of agriculture and lieutenant governor are all “true farmers.” The governor runs a cattle operation in Polk County, Director of Agriculture Chris Chinn is a fifth-generation farmer who raises swine in Shelby County, and Lieutenant Governor Mike Kehoe produces beef cattle on his family farm in Phelps County. The agricultural background of these leaders is positive for Missouri farmers, said Parson, who also praised the efforts of his cabinet in col­laborating to provide much-needed relief for farmers during this past summer’s drought. Acknowledging that there will always be “tough times,” Parson said preparing Missouri agriculture and rural communities for the future is one of his top priorities as governor. He mentioned expanding access to broadband internet as one example of accelerating education opportuni­ties for today’s youth. Prior to lunch, Missourian, agriculture journalist and national television host Tyne Morgan recorded a segment of the U.S. Farm Report from the conference. In her “Commodity Out­look” session, Morgan featured agriculture economists Dr. John Anderson, chairman of the business, applied and technical sciences at the College of the Ozarks; Dr. Scott Brown, director of strategic partnerships at the University of Missouri College of Agriculture, Food and Natural Resources; and Dr. Pat Westhoff, director of the Food and Agricultural Policy Research Institute. Portions of their panel interview were broadcast the following weekend during the U.S. Farm Report’s regular schedule on RFD-TV. The conference organized sessions around the MDA’s ongoing “MORE” initiative. During the “feedMORE” segment, Dean Chris Daubert of MU’s College of Agriculture, Food and Natural Resources previewed a soon-to-be-released study that shows Missouri has the capability to grow the impact of its food and agriculture industry by more than $25 billion in the next eight years. The study was commissioned by the university. A coali­tion of agriculture industry partners, including MFA Incorpo­rated, contributed to the initiative. According to the study, the best way to boost agriculture from its current level is to focus on taking raw products Missouri already produces and adding value to them through advanced man­ufacturing or processing efforts. The feasibility study made three main recommendations. First, Missouri should create a network of universities, colleges and Extension offices that can coordinate resources and identify new business opportunities. Second, the study recommends focusing on creat­ing products that can address issues re­lated to human and agricultural health challenges through precision medicine. Finally, the study suggests an initiative to grow value-added food processing and manufacturing to benefit both crops and livestock. By implementing the suggestions, the impact to Missouri’s economy by 2027 has the potential to be dramatic. Business growth from these efforts could create and support nearly 70,000 new jobs and generate nearly $4.4 billion in new personal income. Im­portant to all Missourians, the growth would raise annual state and local tax revenue by more than $1 billion. Dean Daubert told the conference audience that the full study would be completed and available for public viewing by the end of January. The final version will be available on the Missouri Agricultural Foundation’s website once the report is released. Another food-focused session at the conference featured Vivian Howard, chef, author, restaurant owner and TV personality, who served as keynote speaker on Thursday, Jan. 10. She shared her story of returning to her small-town North Carolina roots to open a farm-to-fork restaurant and discussed her expe­riences as star of the PBS show, “A Chef’s Life,” which just ended a five-season run in October. Eric Maly, with the Food Bank for Central and Northeast Missouri, explained the organization’s mission to improve the status of food-insecure families in its 32-county service area. The organization works with 140 food pantries, soup kitchens, shelters and other agencies to identify need and distribute food. Efforts include mobile food pantries to serve areas that do not have a permanent site and “Buddy Packs” at elementary schools to provide students with ready-to-eat food to take home over the weekends. A summer feeding program provides weekday lunches in areas with high poverty rates. Other governor’s conference sessions focused on technol­ogy, from connecting rural communities with high-speed internet to advances in crop research and development. Todd Sears, president and CEO of IntelliFarms, shared the story of economic development in his small town of Archie, Mo. He connected with the right resources to bring high-speed internet to the rural Missouri town, helping to ignite businesses in his community. The buzz about “blockchain” was addressed by Mark Pryor, chairman and CEO of The Seam, a leading provider of trading and technology solutions. Pryor said demands for increased traceability and transparency throughout the agri­culture supply chain are at an all-time high, and blockchain technology is poised to provide a common digital fabric with open, neutral, borderless possibilities. Dr. Jeremy Williams, senior vice president for Bayer Crop Science, discussed how advances in molecular breeding, biotechnology and gene editing, combined with data sci­ence and artificial intelligence, will empower growers. Missouri Ag Director Chinn, who gave her keynote ad­dress on Friday morning, said the conference was a positive way to kick off 2019. Written by Jason Worthington, senior staff agronomist; Cameron Horine, staff agronomist; & Dr. Jason Weirich, director of agronomy on 04 February 2019 . In the 2018 growing season, more than 400 MFA employees, ag industry personnel and growers toured MFA’s Training Camp test plot in Boonville, Mo. The site hosted MFA’s Seventh Annual Training Camp in July as well as small groups of producers who toured the site with their local MFA employees. Training Camp gives participants an opportunity to get hands-on participation in MFA’s testing and product evaluation process. Participants viewed trials on MorCorn hybrids and MorSoy varieties, corn and soybean seed treatments, foliar nutritionals and fertilizer studies. They also heard presentations from experts on extended-diapause rootworm, understanding dicamba volatility, tools for nitrogen recommendations and potential HT3 soybean opportunities. Camp and other research sites in 2018. MorCorn trials were planted April 19 with a total of 38 hybrids tested ranging from 95-day comparative relative maturity (CRM) to 117-day CRM. We tested 14 MorCorn commercial checks against 23 experimental hybrids and one competitor hybrid. The field was fertilized with 300 pounds of actual nitrogen in the form of SuperU. The planting population was 32,500 plants per acre. Despite the drought and lack of moisture, yields were impressive once again at our site. The top end hit 305 bushels per acre with an experimental hybrid. At the bottom was a MorCorn commercial hybrid at 211 bushels per acre. Results from this year’s MorCorn Training Camp trials, along with 2017’s yield comparison can be seen in Figures 1A and 1B. In addition to Training Camp, these hybrids were tested across multiple environments and geographies in 12 other locations within MFA’s trade territory. Figure 1C compares yield for the hybrids that have been tested multiple times from 2015-2018 at our 12 replicated sites. In terms of soybeans, the diversity in the MorSoy lineup reflects the diversity of MFA’s trade territory. MorSoy seed products include soybean maturities from 3.0 to 5.0. This line also includes conventional seed as well as RoundUp Ready 2 Yield Technology, RoundUp Ready Xtend and LibertyLink traits. This year’s MorSoy variety trials were planted May 24. There were a total of 42 varieties tested: 28 MorSoy commercial checks against 12 experimental varieties and two competitor varieties. The planting population was 140,000 plants per acre. The soybean varieties were divided into four trials to compare by relative maturity ranges. The trials include all of the herbicide technology traits combined, so weed control is maintained with a sound agronomic conventional herbicide program. Results from this year’s MorSoy Training Camp trials, along with 2017’s yield comparison, can be seen in Figures 2A, 2B, 2C, and 2D. In addition to Training Camp, these varieties were tested across multiple environments and geographies in 12 other locations within MFA’s trade territory. Figure 2E compares yields for the varieties that have been tested multiple times from 2016-2018 at our 12 replicated sites. Nitrogen loss and its causes are perennial concerns for growers. Are we losing the nitrogen to volatility, denitrification or maybe leaching? What can we do about it? For several years, we have evaluated the use of nitrogen stabilizers on urea. It is important to test these products every year for a couple of reasons. First, new products come out that claim to provide the same protection as proven products against volatility, denitrification, leaching or a combination. Over the past few years, we have seen that products containing nBPT (the active ingredient that combats the urease enzyme and limits volatility) yield higher than products without nBPT. University research shows that volatilization can result in up to 40 percent of nitrogen loss if it’s not incorporated into the soil within 5-7 days or protected with a nitrogen stabilizer. MFA’s nitrogen stabilizer N-Guard is a proven urease inhibitor (nBPT) to limit nitrogen loss by volatilization, the most common form of nitrogen loss with dry fertilizer products. SuperU provides protection from volatilization as well as denitrification and leaching by providing a nitrification inhibitor (DCD) along with a urease inhibitor. Second, weather conditions vary year to year, and N application timing can affect how certain products perform. Applying N at the time when the crop is going to best utilize it is not only a good farming practice but also a good nutrient stewardship practice. In pre-plant N applications, nutrient losses will be different than top-dress applications. When you apply nitrogen pre-plant, it is susceptible to losses for a longer period of time before the plant is ready to utilize it. Pre-plant applications benefit more from nitrogen that contains a stabilizer to defend against losses both above and below ground. The inhibitor protects the nitrogen from volatility until the prills are incorporated into the soil and guards against denitrification and leaching once in the soil and before the plant reaches the V5-V6 growth stage. That’s when nitrogen uptake really increases and must be available to the plant. In top-dress situations, having nitrogen stabilized with N-Guard helps to protect nitrogen from volatilization in the warmer, drier conditions of the growing season when it may take longer for the nutrient to become incorporated into the soil. Nutrient stewardship is important to the landscape of agriculture and its future as well as to MFA. Along with being good nutrient stewards by protecting our nitrogen with proven stabilizers, it is important to follow the 4Rs: right source, right rate, right time and right place. This past year, we had the opportunity to partner with Bayer Crop Science to grow HT3 soybeans at our research site. These beans are tolerant to three herbicides: glyphosate, dicamba and glufosinate. HT3 soybeans are still a regulated product and haven’t been approved by the European Union, so the seed is not allowed to enter the grain market. We destroyed our HT3 plot prior to R1, but we were still able to see the value this technology will bring to the table. Overlapping residuals remain key, and issues from the field with PPO, Liberty, dicamba and Roundup technology aren’t likely going away. Technology that would allow the use of Liberty, Roundup and dicamba over the top of traited soybeans is badly needed. Demand for sulfur fertilizers over the past decade or longer has increased for good reasons. Cleaner air has reduced atmospheric sulfur, and higher yields have led to very favorable crop responses from supplementary sulfur fertilizers. Due to elemental sulfur’s slow breakdown, ammonium sulfate (AMS) has long been the preferred S source in top-dress situations due to its rapid availability. However, ammonium sulfate does pose challenges in terms of acidifying soils and leaching. This year at Training Camp, SymTRX 20S, a sulfur source from Anuvia, was tested against the industry standard of AMS in a top-dress application on corn. SymTRX 20S is a fertilizer with a guaranteed analysis of 16-1-0-20S. Unlike most commercial fertilizers, it is processed from recycled food wastes, making it a very sustainable nutrient source. Like AMS, it contains a sulfate form of S which is readily available to the plant. However, being derived from food waste, SymTRX also contains some organic matter that Anuvia calls the “Organic MaTRX” containing both positive and negative charged particles that reduce the leaching potential normally associated with sulfate. Separate treatments containing SuperU and two different rates of either SymTRX 20S or AMS were applied at V6. All treatments received a base rate of 175 pounds of N in the form of SuperU at planting. At V6, the control was top-dressed with an additional 75 pounds of N from SuperU while each subsequent treatment was top-dressed with 75 pounds of N and either 20 or 30 pounds of S from SymTRX 20S or AMS and SuperU. There was no statistical difference in the results. SymTRX performed equally to AMS-based sulfur applications in this trial, giving confidence in the product as a suitable form of S fertilization that can be a sustainable alternative to commercial fertilizers. Limited rainfall after top-dress applications at the Training Camp site likely negated any advantages to reduce sulfate leaching. Benefits from foliar fungicides have been well documented, both from a disease-control standpoint and from positive effects toward plant growth and development. Two main fungicide groups have provided the base of fungicide treatments: triazoles and strobilurins. A combination of these two broad-spectrum chemistries had been considered the soundest course of action for fungal disease control in corn, soybeans and wheat. However, recently several products have entered the marketplace containing a compound with a third site of action, namely succinate dehydrogenase inhibitors (SDHI). SDHI fungicides are typically narrower in spectrum of disease control, but can be effective in targeting an important disease group. SDHIs may have properties of increased xylem mobility and residual activity not found in other fungicide groups. While having differing sites of action, SDHI and strobilurin fungicides share the same mode of action, which may create synergies in disease control and plant growth benefits such as slowed respiration and fruit ripening, increased stress tolerance and nitrogen metabolism. While fungicides are often evaluated at the Training Camp site, the benefits are hard to capture in small plot research. We evaluated one of the new SDHI products—Miravis Neo from Syngenta—in two large soybean side-by-side trials. Miravis Neo claims to be an improvement over typical strobilurin and triazole mixes due to Adepidyn, an SDHI compound. Adepidyn is said to have extended residual control and increased leaf uptake and movement as well as increased “plant optimization” effects. Increased control over frogeye leaf spot, a highly problematic disease in soybeans, is also a noted advantage. These sites were conducted on growers’ fields enrolled in MFA’s Crop-Trak program. Consultants monitored the effects of the treatments weekly and helped capture as-applied information and yield monitor data. At each site, 20 acres were applied with Miravis Neo and compared to a competitive fungicide check. Frogeye leaf spot pressure was noted at each site. Visual documentation and yield results both showed a notable advantage of Miravis Neo over a competitive check of a strobilurin and triazole premix. Frogeye leaf spot control from visual ratings was superior with Miravis Neo. Staygreen and plant vigor also appeared greater in the Miravis Neo treatment compared to the competitive check. The amount of increased plant vigor from disease control as compared to metabolic and plant growth effects is unknown. The trends in the yield maps below are a better indicator than numeric differences in yield. Click HERE to view this 7 page article with all 12 charts & maps as printed via the flipbook version of magazine. Click Here to see more articles from this issue. Written by webadmin on 31 January 2019 . 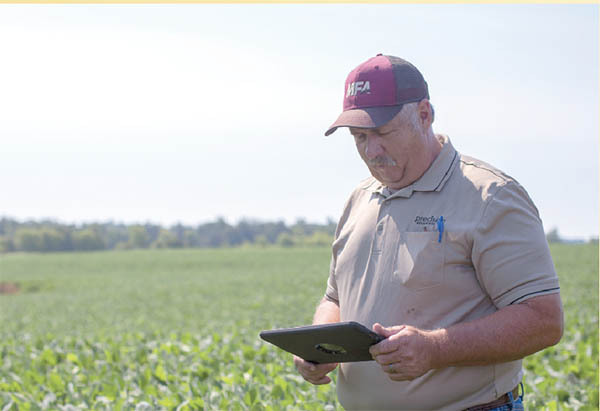 MFA expanded the partnership between its precision agriculture programs and Adapt-N, a professional software tool that combines advanced crop modeling with soil-type information, field management data and weather to establish in-season, variable-rate nitrogen recommendations. Adapt-N is now available to the entire MFA trade territory. Working in conjunction with MFA’s Nutri-Track and Crop-Trak precision programs, Adapt-N adds another layer of beneficial data for growers by allowing them to leverage field data already available within the MFA system to help maximize yield while minimizing environmental impact. Two new premium horse feeds—Exceltra and Suprema—were added to MFA’s nutritional lineup. They are the first equine rations to offer MFA Shield Technology. Exceltra is designed for growing, showing and working equine of all ages; Suprema is formulated for the needs of older horses. Both feeds are beet-pulp based and contain low levels of sugars and starches. In addition, the first MFA cattle supplement tub with Shield Technology was also introduced. The new Performance First Tubs are also unique because they are made exclusively for MFA by MFA, rather than a third-party manufacturer. As concern about dicamba-tolerant technology continued to grow, MFA’s agronomy team took a proactive approach to steward the technology. In 2018, MFA trained more than 1,200 applicators, chemical handlers and retail staff on proper use of dicamba and the Roundup Ready Xtend crop system. MFA also established and scouted a network of “sentinel plots,” and applicators were alerted to stop spraying when the majority of soybeans in their area reached the R1 reproductive stage. The stringent protocol was deemed a success, with a dramatic drop in complaints by MFA customers about off-target crop damage compared to 2017. After a wet, cold spring, weather woes continued into summer with hot, dry conditions that put much of MFA territory into the worst growing-season drought since 2012. At the drought’s peak in August, more than 88 percent of Missouri was experiencing some degree of abnormal dryness, and both livestock producers and row-crop growers were adversely affected. MFA worked to make sure producers were aware of government relief programs and organized producer meetings to provide information on how to stretch short forage supplies and drought-proof farms for the future. Members of MFA’s precision agronomy team earned their wings as certified drone pilots and are now using unmanned aerial vehicles to capture aerial crop imagery to help diagnose insect and disease infestations and nutrient deficiencies. The drones allow MFA agronomists to get an overview of fields and identify potential problems that cannot readily be seen from the ground. Spots of concern will be scouted to confirm the issue. 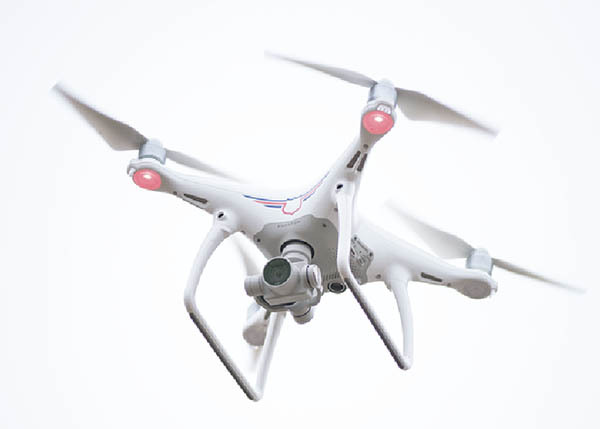 Everyone who operates MFA drones has passed the Section 107 Airman Knowledge Test, received a remote pilot’s license from the Federal Aviation Administration and completed training from the drone supplier. MFA has long been a leader in promoting practices such as variable-rate fertilizer application, cover crops, nutrient management plans and other environmentally friendly farming methods. Last year, MFA took that commitment a step further by entering into a unique agreement with the Missouri Department of Conservation and USDA’s Natural Resources Conservation Service to hire our first-ever natural resources conservation specialist. The purpose of the position is to help farmers meet their stewardship goals by working with all three partner organizations. In not-so-welcome news for corn growers, MFA agronomists and the USDA Agricultural Research Service confirmed the presence of northern corn rootworms with an “extended-diapause” trait in northwest Missouri. This genetic adaptation allows rootworm eggs to survive through two winters. Crop rotation is traditionally the cure for rootworm infestations, but extended-diapause eggs lie dormant in the subsequent soybean crop and then hatch when corn is planted again. Hybrid selection and in-furrow insecticides are the best options available to combat these pests, which can cause substantial yield loss and standability issues. If the extended-diapause population continues to increase, MFA agronomists warn that rootworms will have to become a focus of integrated pest management. In the spirit of cooperation, MFA supports causes, organizations and community activities throughout its trade territory. In 2018, MFA helped raise more than $145,000 to combat childhood food insecurity through the “Drive to Feed Kids” campaign in partnership with Missouri Farmers Care. Additionally, the MFA corporate office raised money for its chosen charity, the Central Missouri Honor Flight. MFA also championed agricultural education, including widespread support of 4-H, FFA and Ag Education on the Move. The MFA Foundation awarded 342 high school seniors $2,000 scholarships, totaling nearly $680,000. A separate fund, the MFA Incorporated Charitable Foundation, also provides support for worthy projects. Created on 30 January 2019 . Written by Mike Smith, MFA Crop Insurance Principal Agent on 30 January 2019 . How much do you know about your policy? In my 28 years of meeting with farmers, I still come across producers who want to understand their crop insurance better. I’ve often heard comments such as, “You have explained more to us in 15 minutes than we have understood since starting to insure.” Although I am humbled by such comments, I am disappointed that no one has ever explained crop insurance in a manner that they understood. Producers should hold their agents accountable for the service they are paying for. 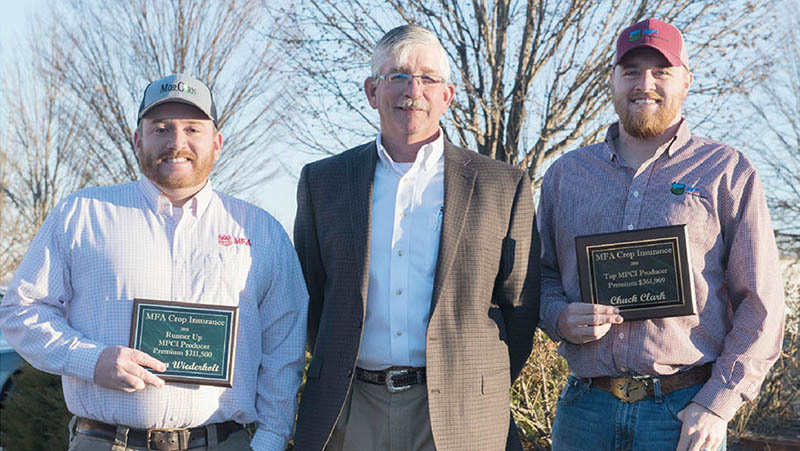 MFA Crop Insurance Principal Agent Mike Smith, center, recently recognized the program’s 2018 top performers, Adam Wiederholt, left, with MFA Agri Services Northwest Group, and Chuck Clark of MFA Agri Services Iowa Group. How many of these questions can you answer about your crop insurance? 1. How is your actual production history determined? 2. How is the value per bushel guarantee established? 3. How is my guarantee affected when the prices fall at harvest time? 4. When does my insurance coverage end? 5. What if I lose a complete field to a covered loss? How will I be paid? 6. What if I can’t get all my fields planted? 7. What if I can’t get all my fields harvested? 8. Am I utilizing my crop insurance in the manner it was designed? Am I maximizing marketing opportunities? 9. How much of my crop am I self-insuring? 10. Is my coverage structured in a manner that allows me to withstand a catastrophic year? These and many more questions can be answered when you have an agent who takes the opportunity to contact you for a consultative appointment. Knowing the ins and outs of your crop insurance could be the most important aspect of your farming operation this year. March 15: Spring crops sales closing date (differs slightly in some areas). April 29: Deadline to report last year’s spring crops production. July 15: Deadline to report 2019 spring crops planted acres. October 1-31: Harvest price discovery period for spring crops. December 10: End of insurance period and last day to turn in a claim. These are just a few important dates that pertain to spring-planted crops. There are numerous dates involved with crop insurance. Many of the dates are specific to your location. I encourage you to visit with one of our local agents to confirm dates that are important to your farming operation. CLICK TO VIEW this story in flipbook form as originally printed.